Putting the ball in the hands of Drew Brees is usually a good thing. Sunday, he took the Saints on his shoulders, leading New Orleans to a wild 35-28 win over the Bucs that came down to the games final play. Tampa Bay appeared to have tied the game when Josh Freeman hit Mike Williams with a 9-yard TD pass on the games last play, but Williams went out of bounds before catching the pass, and therefore it was ruled illegal touching, ending the game. Brees was outstanding, overcoming an early 14-0 deficit as he would up going 27-for-37 for 377 yards with four TD’s and a pick with a QB rating of 130.1 on the day. The Saints QB went back and forth with Bucs QB Freeman, who also played well in the setback. Freeman threw for 420 yards with three touchdowns, and nearly lead his team back before finally falling in the end. New Orleans trailed 14-0 at the 5:55 mark of the first quarter when Bucs RB Doug Martin rushed to the left for a 36 yard touchdown to give Tampa the early two TD lead. Brees then went on a tear, throwing four touchdowns in the next 20 minutes of play to get the Saints to a 28-21 lead at the half. Four different Saints caught the TD’s to give them the lead. Pierre Thomas put the Saints up two scores at 35-21 with 13:23 to play, but the Bucs got a late TD when Freeman hit Dallas Clark with a 3-yard score with 4:10 to play to make it 35-28. Vincent Jackson set Bucs records for receiving in a game with 7 grabs for 216 yards and a score, including a 95-yard TD. 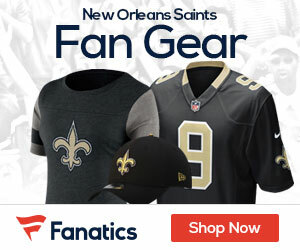 Lance Moore lead the Saints with 9 catches for 121 yards. 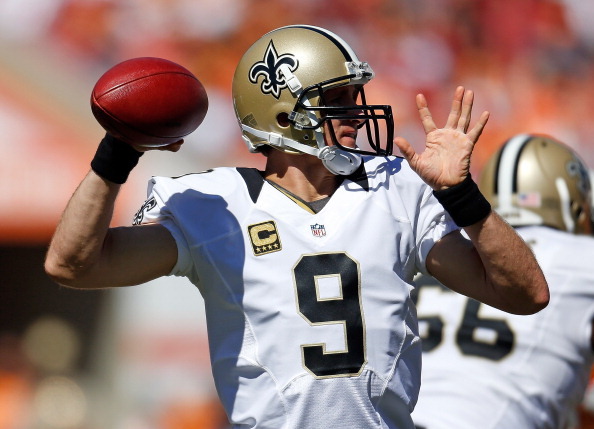 The Saints at 2-4 will be at Denver to play Peyton Manning and the Broncos next Sunday night.